The website continually updates the number of animals who have been killed since you first open the page. 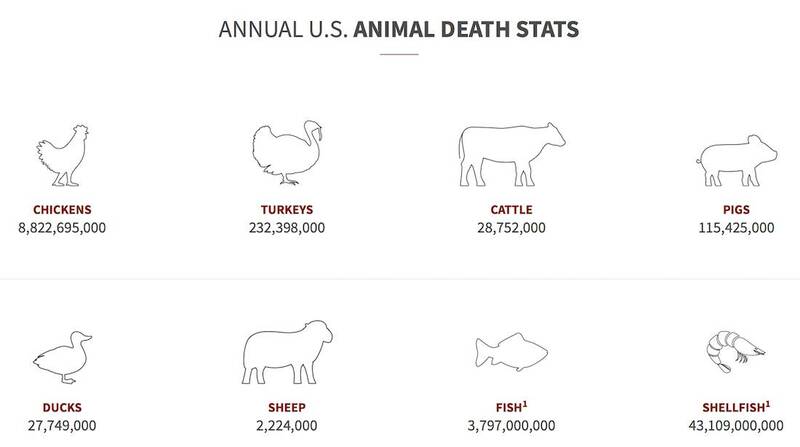 How many animals are killed for food in the US each year? United States Department of Agriculture records show that 9.2 billion land animals were slaughtered in 2015. Accounting for net U.S. land animal exports of approximately 18% (almost all chickens), 7.5 billion land animals were slaughtered to support the U.S. food supply. In addition, roughly 5% of farmed land animals (mostly chickens) die before slaughter. Inclusive of these deaths, 7.9 billion land animals died to support the U.S. food supply in 2015. Marine animal deaths are challenging to calculate since these lives are measured in tons. A very thorough analysis completed by Counting Animals estimated that 3.8 billion finned fish and 43.1 billion shellfish were killed to support the U.S. food supply in 2013. Taken together, nearly 55 billion land and sea animals are killed annually to support the U.S. food supply. Adding in bycatch (sea creatures caught and discarded--injured or dead) and feed fish, the total number jumps substantially. To put this in perspective, during World War II--the deadliest conflict in human history--more than 60 million people were killed over 6 years. The same number of animals die in support of the American food supply every ten hours.